DUP leader Arlene Foster has warned her party's confidence and supply deal with the Conservative party will have to be revisited should the Brexit withdrawal agreement pass through Parliament. She was speaking to the BBC ahead of her party's annual conference. The party has told the Prime Minister to ditch the controversial backstop in the agreement and explore other alternatives outlined in the post-Brexit future trade political declaration between the EU and UK. Theresa May said not backing her withdrawal agreement risks crashing out of Europe in March with indications coming from Europe there is no appetite - or time - to start again. Since the withdrawal agreement was published the DUP has been at odds with the Conservatives. However, despite refusing to support the deal and voting against the government in the Commons both sides have said the confidence and supply arrangement is not dead. Arlene Foster said the Prime Minister had not breached her party's red line - that Northern Ireland would be divided from the rest of the UK - as she had not got the deal through Parliament. "She has the intent to break the red line," she told the BBC. "If she is successful in parliament and there is no evidence she is going to be successful in parliament then of course we will have to revisit the confidence and supply arrangement. "That agreement was about getting national stability, it was about acting in the national interest and delivering on Brexit. "If this is not going to deliver on Brexit then of course that brings us back to the situation of looking again at the confidence and supply deal. "But we are not there yet and we are not going to jump ahead until we see what happens in parliament." Chancellor Phillip Hammond is in Northern Ireland to attend the DUP conference for a private function. On Saturday Boris Johnson will give a speech just before the party leader. 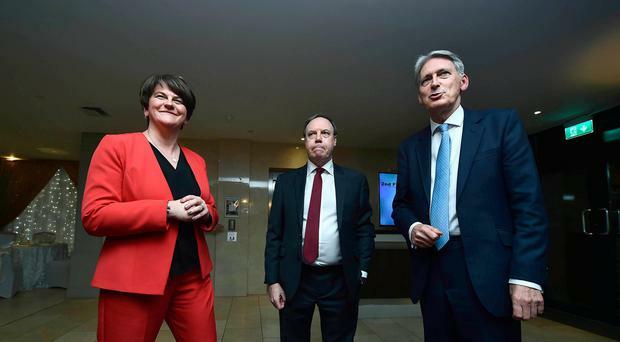 Mr Hammond met DUP leader Arlene Foster and her deputy Nigel Dodds in the lobby of a Belfast hotel before holding a meeting with them. He said he was delighted to be there and relations between the two parties were good. Given the lack of support for the Prime Minister's deal, Arlene Foster said time could be better spent working on a new arrangement. She described as "mythical" warnings of a hard border being imposed at the Irish border. She said an "awful lot of time" had been wasted not looking at technological solutions to the border. "Instead of wasting time promoting a deal that's not actually going to get support, wouldn't it be much better to use of that time to get a better deal.," she added. "To get a deal for everyone to sign up to and to ditch the Irish backstop because it is not needed."